Last summer, carfuls of millennials in trendy hats, plaid flannels and new hiking boots descended on Oz Farm, a vast, rural property five miles north of Point Arena, and settled in yurts and tents on the dusty ground. It looked like an Urban Outfitters catalogue shoot. The tents were provided by North Face and dinner was catered by San Francisco's Hook Fish Co. Bottomless vodka cocktails, free-flowing wine and kombucha on tap kept the crowd happy. 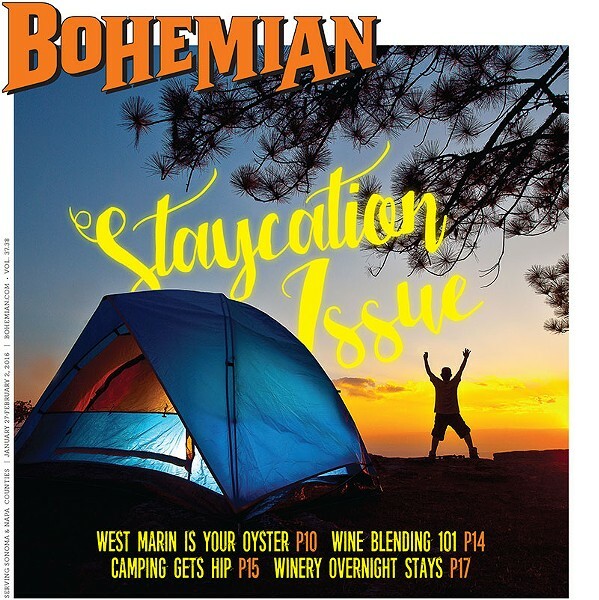 "Hipcamp is everywhere you want to camp," the company proclaims on its website. "Search, discover and book ranches, farms, vineyards, nature preserves and public sites for camping across the U.S." Its goal is to simplify and improve the often unnecessarily complicated task of booking a campsite. Ravasio, the company's CEO, grew up in Corte Madera, "swimming in the oceans of Stinson, hiking the bluffs of Point Reyes and camping in the valleys of Mt. Tam," and graduated from UCLA in 2011 with a customized degree in "digital democracy." Like many businesses, Hipcamp was born out of necessity and frustration. "I had this dream of spending New Year's Eve 2013 camping so I could spend the first morning of the year writing in my journal by the ocean," Revasio says. "After many painful hours of searching, I almost gave up—it was so difficult to figure out where I could go." She finally booked a place, but missed a key detail. "Upon arriving," she says, "I realized that despite searching a handful of different websites, including the state park page, I'd failed to learn that it was home to a beautiful surf break, and I'd left my surfboard at home." Instead of spending the first morning of the year writing, Revasio instead watched, envious, as other surfers had all the fun. "I tried so hard to plan this trip, and still failed," she says. "So we always joke that Hipcamp 'started with a wave,' but really, it's true!" Hipcamp initially covered only Northern California, an area "blessed with magical coastlines, soaring mountains and beautiful forests," Revasio says, adding the convenient proximity to tech-capital San Francisco as well. The website now covers all 50 states. Its popularity grew by word of mouth that was fueled by a clever referral program: refer a landowner and receive $100 if the landlord lists the site. For aspiring campers, things are made easy through a search engine that filters options by such features as "cave" and "beach"; activities such as "kayaking" and "fishing"; and amenities and types of lodging from RV parking to cabins. (Reviews are also provided.) Prices range from $35 for a campground to $175 for a rustic barn with a shower and a stove. Land sharing and tapping into the private sector is especially important to Revasio. "With Hipcamp, you're going places that you couldn't go before," she says. "You're also supporting landowners who want to keep their land open and undeveloped." Revasio additionally stresses the communal aspect, which allows campers to mingle with owners and experience "the cultural exchange between urban and rural." Not all owners will greet you personally, cup of coffee in hand, though many are onsite and willing to chat. "It's a great chance for two people who are otherwise unlikely to meet to connect and learn from each other," Revasio says. Hipcamp is not alone on the camping trail. Reserve America, a much older and established website, was the first to marry camping and technology, though Hipcamp's youthful team and slick design set it apart and welcome lumbersexual millennials. It's also right in line with the meet-the-locals premise, which promises an authentic experience and fresh air to cynical urbanites. Hipcamp might seem aimed at big city dwellers, but it's also ideal for North Bay residents seeking to discover natural treasures in their own backyard. Driving for an hour or so and checking into a yurt or a coastal cabin can be as far from home as it gets, and who knows, you might end up befriending the plaid-wearing, honey-making, sustainable-farming neighbor you never knew you had.